Ok so I am 100% aware that Christmas is 39 days away, but the cooler weather, holiday props at work, and Christmas music in the stores have me in the spirit.. Check out the below cupcakes.. they are on my MUST MAKE list this season!!! Preheat oven to 350F. Line a 12-cup muffin tin with paper liners.In a large bowl, mix together eggs and sugar until mixture is light and creamy and the sugar has mostly been dissolved. Stir in milk, vegetable oil, vanilla and peppermint extracts.In a medium bowl, whisk together flour, baking powder and salt. Pour into wet ingredients and whisk just until batter is smooth. Measure out one cup of batter and place it back in the medium bowl. Add red food coloring to this bowl and whisk to incorporate.Put a spoonful (approx 2-3 tsp) of the white batter into the center each cupcake paper and let it spread slightly on its own. 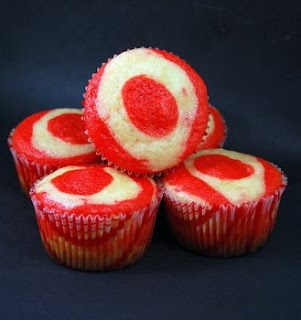 Put a spoonful of red batter in the center of the white. It will push out the other batter and, as it sits for a moment, will also spread itself. Alternating spoonfuls of the two batters and trying to keep the amounts as even as possible (after the first layer, I used smaller amounts of red and white with each spoonful), repeat the technique until all the batter has been used up.Bake for about 15 minutes, until a tester inserted into the center of each cupcake comes out clean and the top springs back when lightly pressed.Cool completely on a wire rack before frosting. In a medium bowl, combine cream cheese and butter. Beat until smooth, then mix in vanilla extract, milk and 1 cup of confectioners’ sugar. Beat until very smooth, then gradually blend in additional sugar until frosting is fluffy, thick and easy to spread. 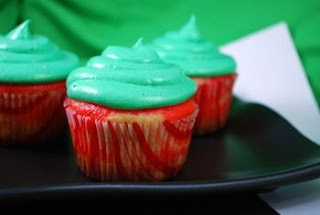 Beat in up to 1/2 tsp green food coloring to dye the frosting, if you wish.Frosting can be spread onto the cupcakes or piped on using a piping bag. I'm sure these would be a hit at any Christmas party! !